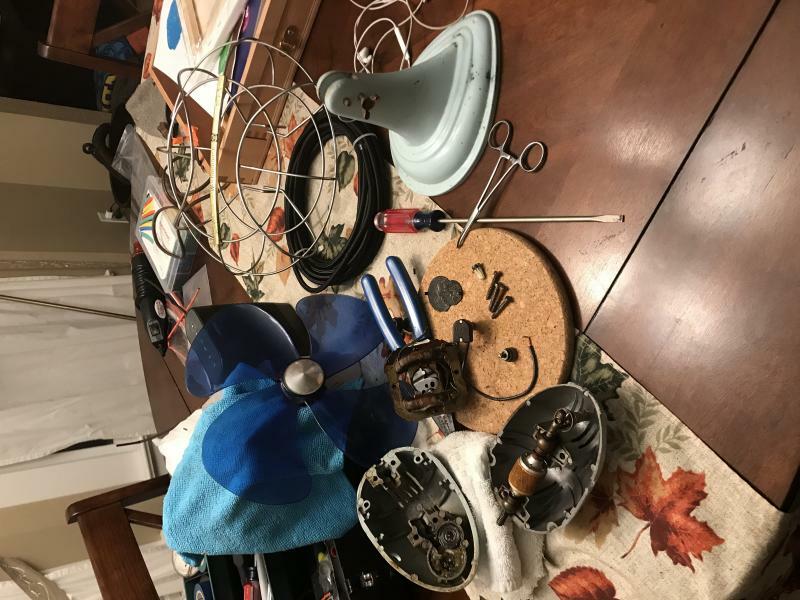 The fan on the far left in the photo is a late 1940s vintage Westinghouse PowerAire fan 12" model but it has the wrong blade assembly on it. 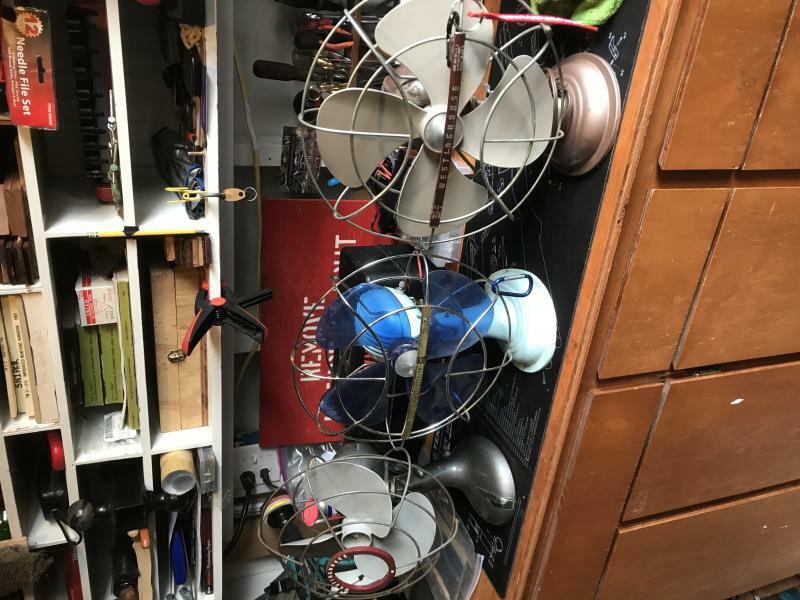 the middle and right ones are what are called Westinghouse LivelyAire fans and they are also 10" models those date to the 1950s, and are 2 speed fans the PowerAire is a 3 speed fan. 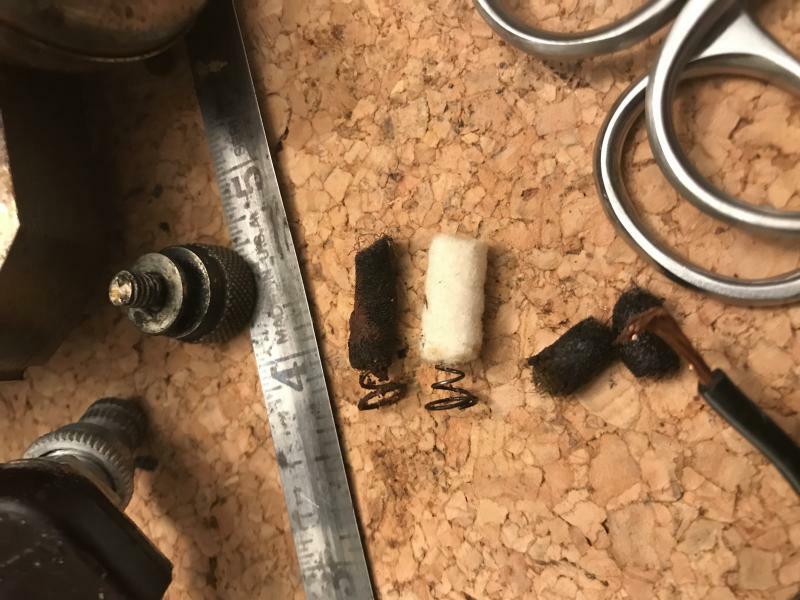 It’s not a far stretch to say this is not a factory wire job.... 3 wires, only two connected and the string was a nice touch! Actually the fan on the far left is also a 10-inch fan, not a 12-inch. 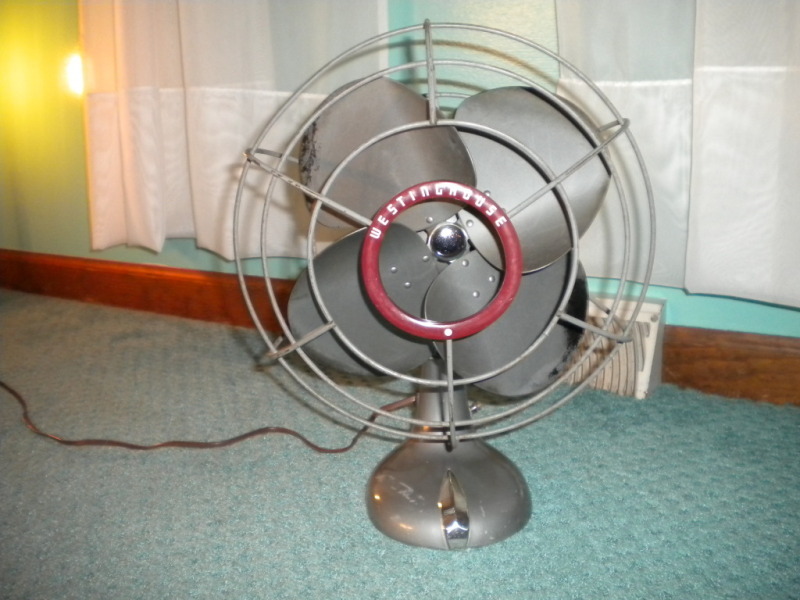 It is a power-air from the late 1940's or early 1950's and the blades are correct. 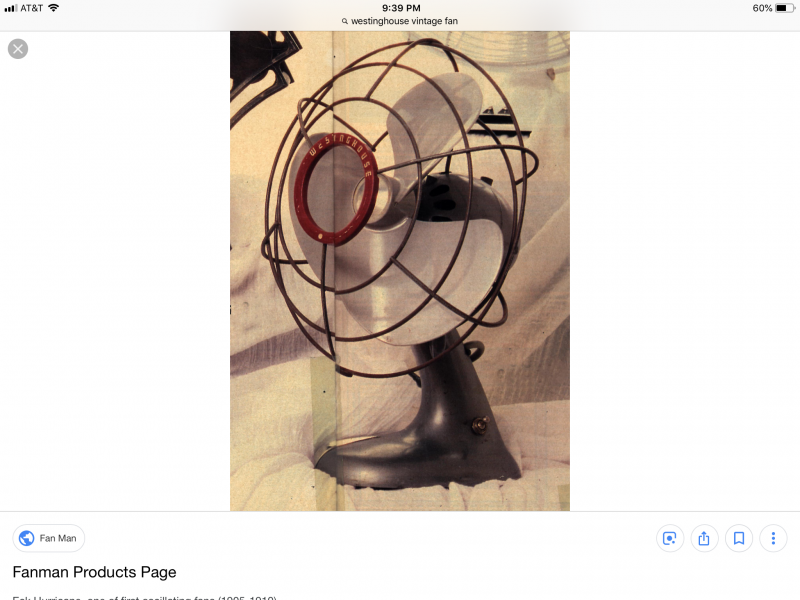 Some of the later fans of that style (10 inch versions only) had those plastic blades. David Northam wrote: Actually the fan on the far left is also a 10-inch fan, not a 12-inch. 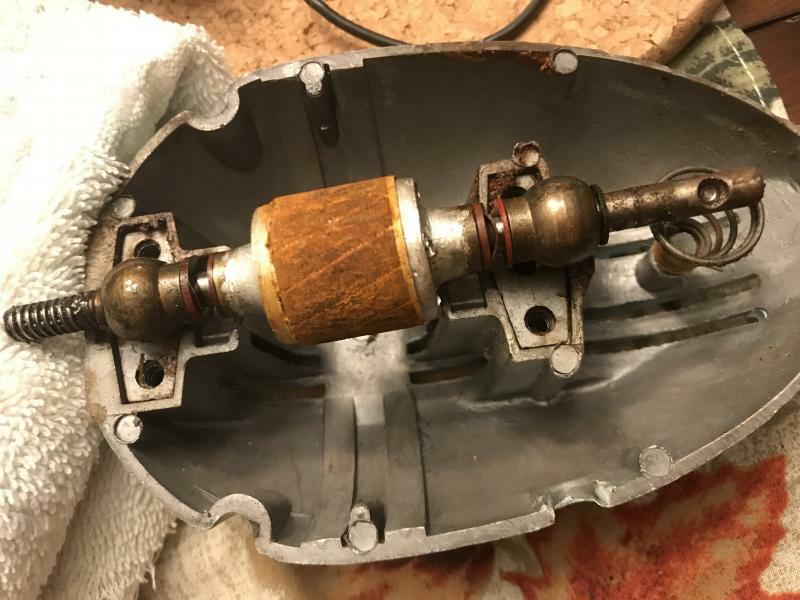 It is a power-air from the late 1940's or early 1950's and the blades are correct. Some of the later fans of that style (10 inch versions only) had those plastic blades. David that PowerAire I don't think has its original blade on it, because I've seen many a PowerAire from that time period (I actually own one myself a 16" model) and I know that they had the Micarta blades on them, and the 10 and 12 inch models had a chromed, or painted insert in the middle of the blades, the LivelyAires I know they have the original blades because I've seen those fans with those plastic blades on them before, in fact the church I grew up in had a LivelyAire just like those with the brown plastic blades but they threw the fan out because they thought that with all of the kids around the church that the fan would be a safety hazard, even though it had plastic blades which wouldn't of hurt anyone. Peter Buffo wrote: It’s not a far stretch to say this is not a factory wire job.... 3 wires, only two connected and the string was a nice touch! 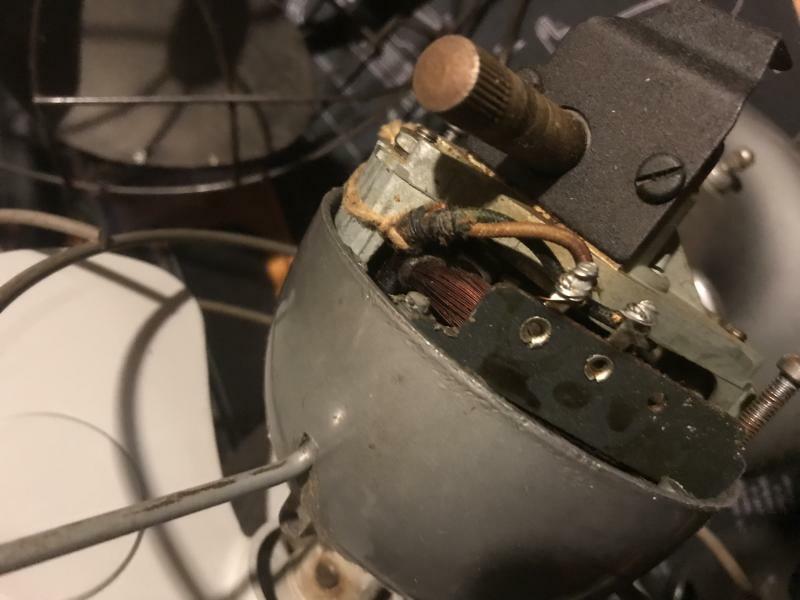 Actually that is a factory wiring job on that fan, the smaller PowerAire fans had shaded pole motors in them whereas the bigger 16" model had a PSC motor in it (where it uses a capacitor to make the motor run) which requires 3 wires whereas the Shaded Pole motors only need 2 wire to run. Nice trio of Westinghouse fans !! 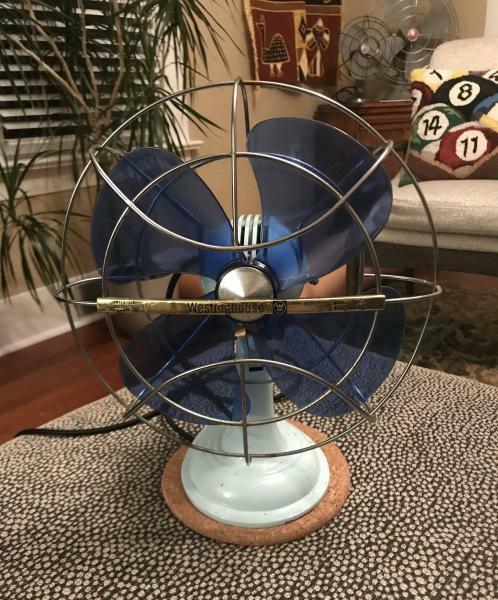 The 3 wing is a mid 50's 1955 Poweraire 2 speed the blade IS Correct and they move tons of air quietly.The Powder Blue with translucent blue blade is a later Livelyaire renamed as the Pacemaker a premium fan introduced in 1962.The mauve and tan Westinghouse IS a Livelyaire,that blade is a Hemcolite blade as Westinghouse called it introduced in 1954.so I'd say it dates to about 1954 or later.All 10" fans !! All good fans !! Congrats !! Thank you! 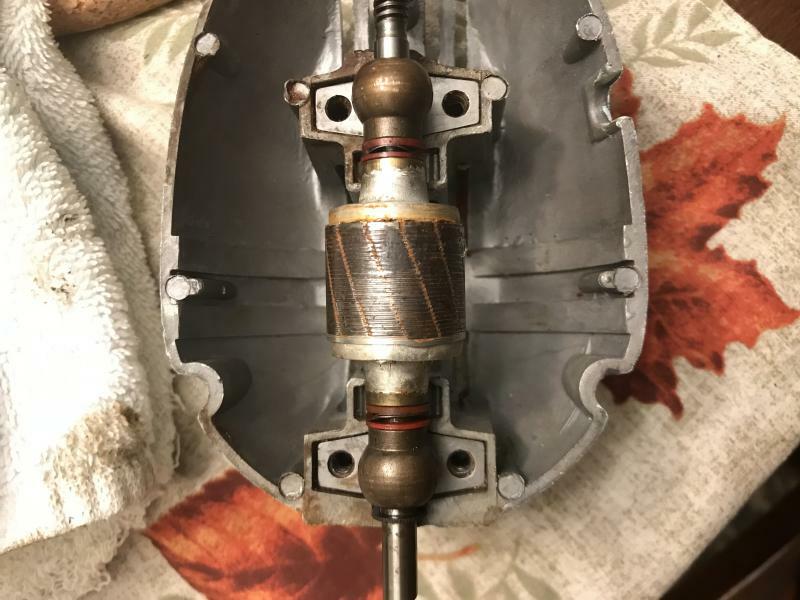 Just figured out the headwire on the Poweraire was disconectes and got it running! It is beautifully smooth and moves serious air! I think the only part missing is the silver cap for the blade. All three Westys are for my Kids. Great finds and not one over $20. Here’s the data plate on the back. 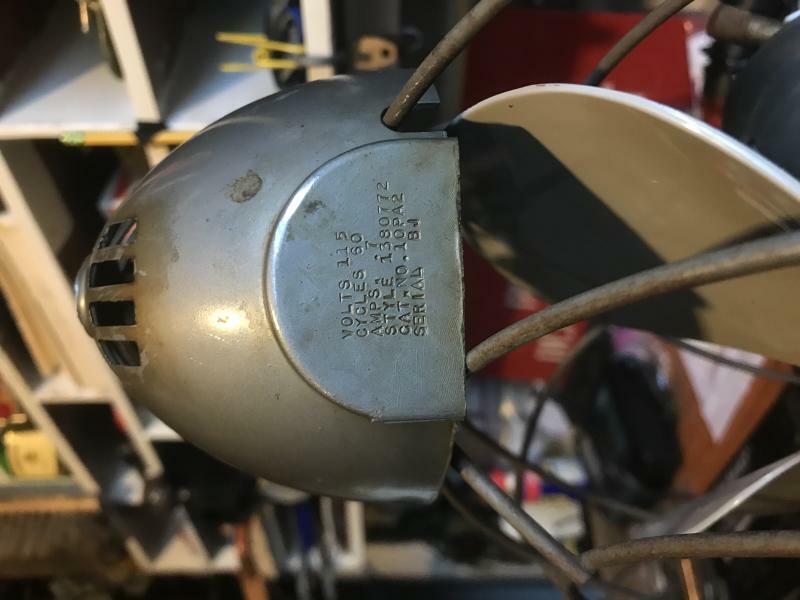 Hmm, your fan has an interesting way of doing the information tag, on my Westinghouse PowerAire (a 16" Model 16PA2 from about 1948 or so) has an actual metal tag riveted to the bottom of the fan motor housing that lists all of the specs (model number, Voltage, Frequency, Amps, and Serial Number) whereas yours has the information etched into the motor housing cover itself rather than an actual metal tag being riveted to the motor housing. And I stand corrected about the blade assembly, I did a GIS and did find a couple of other 10" PowerAire fans with the same blade assembly as yours, but I don't imagine it was a very common blade assembly on these PowerAires because most of the PowerAires I've seen, early and late model ones had the 4 wing micarta blade assemblies with the chrome button in the middle or the large gray colored center hub like the 12" and 16" fans had on their blade assemblies, as the Micarta Blade Assemblies were what they were known for the most, not the cheap plastic ones. The three wing 10" Poweraire's are somewhat common. I have one too. I've never seen them before. I've only ever seen the ones with the micarta blades. The blade in question is indeed factory, and was the bladeset used at the end production run of the 10" version. The bladeset came from the Window Poweraire of that generation. I wondered if Westinghouse just decided it was cheaper to just use one blade as the Poweraire was being phased out of production. The 3-wing plastic blades are actually quite substantial and not "cheap." They are a heavy grade plastic and move a great amount of air very quietly just like the micarta blade versions. I don't have knowledge of the CFMs of the 4-blade micarta versus the 3-blade plastic, but I certainly know the plastic blades are great fans and are not the same of much later versions of plastic bladed fans in which the plastic was much more flimsy. you have 3 nice fans! Question: it ran before and I didn’t run it for more than few minutes, now after a 1 hour test run, it gets pretty warm, approaching hot to touch, any ideas why? Is this normal for this design? It sounds great, no obvious rubbing and I know the oil and grease are good to go. 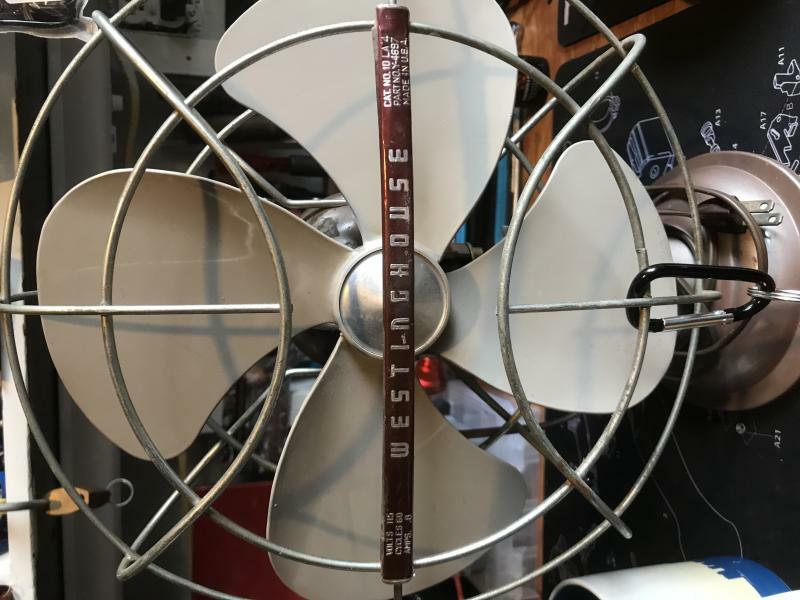 Those Westinghouse LivelyAire fans use shaded pole motors and shaded pole motors tend to get warm to the touch as they tend to run at between 120°F-140°F which is fairly warm to the touch. It's normal for these fans don't worry about it. If you crop the pictures a tiny bit, they will display correctly. Just figured this out.... will do in future. Thanks! Really nice work, Peter! I'll echo what Jeff said above, those can be a real bear to piece back together. Also nice to see two of them have their center caps on the blades, those seem to go missing quite often. Page processed in 0.1832 seconds (10% database + 90% PHP). 31 queries executed.